Ginkgo Gardens is responsible for the beautiful and tranquil gardens at The Ivy Chelsea on the fashionable King’s Road. Launched in the summer of 2015 this hotspot has been one of the most popular places to be seen since opening. The garden is without a doubt the star of the show and is looking particularly seasonal at the moment as the restaurant gets ready for Easter. Decked in brightly coloured pink and yellow flowers, The Ivy Chelsea Garden will be welcoming families from all over the country for their celebrations this Easter weekend, fingers crossed for good weather! Here at Ginkgo Gardens, we are getting very excited about the progress being made to our new wholesale plants site. Clews Lane, which we purchased earlier this year, is being given the full treatment to transform these eight acres into a fully functioning nursery. This land will feature open ground growing as well as green waste management which will help our carbon footprint and recycle the many tons of green waste produced each year. Like our current nursery in Chobham we will have a great site for customers to visit and chose plants for their gardens as well as for us to grow plants for future projects we acquire as the year goes on. See the work in progress below as we install the brand new gates at the site. We hope to have Clews Lane up and running in a year – watch this space! We have recently finished an urban garden in this chic development by Montrose in West London which involved planting up the space and installing great lighting and high finish. 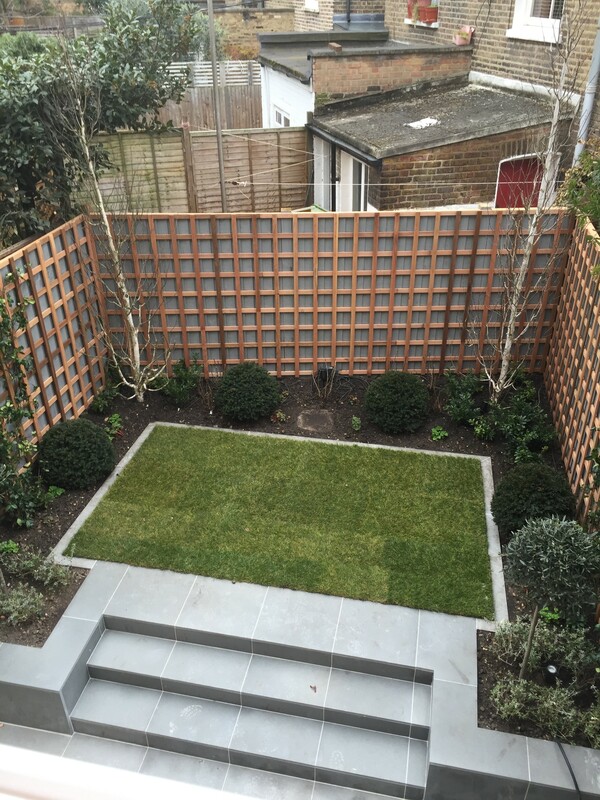 With this project the hard landscaping had been done so we were brought in for our horticultural expertise. Being an urban garden the planting was minimal but we installed planters at the rear and a red cedar trellis to retain a sense of openness. We also installed plant boxes and beds which we filled with flowers to give the space some colour in the summer months. See below some images of the garden during the day and during the night. We are delighted to have recently won a prestigious new project in Westminster which will involve food growing installation. We will be installing sleeper beds and vegetable trugs for different schools and estates in the area. Through this project we will be bringing the joys of gardening to a wide variety of tenants and students with special educational needs and disabilities. At Ginkgo Gardens we always strive to become involved in projects to help the wider community – we believe that gardening is a highly therapeutic and satisfactory way to spend one’s time. We are proud to have won a project which will enable us to contribute to the needs of these children, helping them to focus on an activity which is proven to help those with disabilities and something which is obviously very close to our hearts!